A classic 18ct gold wedding ring. 3mm, D shape and extra heavy weight. Ideal for bride or groom. 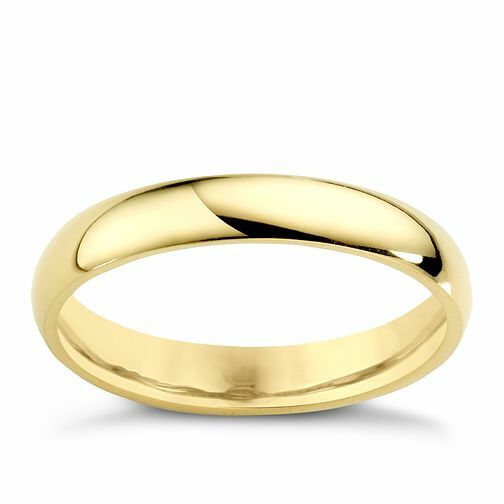 18ct Yellow Gold 3mm Extra Heavy D Shape Ring is rated 4.3 out of 5 by 3. Rated 5 out of 5 by Anonymous from It's comfortable to wear this ring and very light in weight. I like this product because it is easy to wear on daily basis. I bought it for my brother and loves wearing it. Rated 3 out of 5 by Anonymous from Good with a but... Bought online for my fiance after having her finger measured in the shop but found it to be on the small side when it arrived. Fiance took it into the shop and they said it could be re-sized at no cost and would take a week to which she agreed. Went in a week later but wasnt back & assistant said look at receipt it says on there when it will be ready for collection. When she looked it says 7th sept, day before wedding and more than 3 weeks after it was taken in! Now shes panicking hoping it will be back on time. Wouldnt have agreed to have it done if she had realised and maintains the assistant definitely said a week. Would have been much quicker to have returned ring for refund and ordered another which, if like the first, should have come in about 2 days!